It is the duty of Marxists to make clear which class character political forces have. The leadership of the LFI has NOT made clear which class character the liquidationist, petty bourgeois split has. The RCIT supported the popular uprising since it was a democratic revolution against the reactionary bourgeois dictatorship of Gaddafi. We argued that revolutionaries should fight inside the rebel movement against the bourgeois leadership of the TNC, since the later tried – together with NATO imperialism – to contain the revolution and reduce it to the regime-change. We called for the deepening of the revolution by the formation of workers’ and popular councils and militias and its transformation of the democratic into a socialist revolution. We therefore emphatically opposed the NATO attacks. 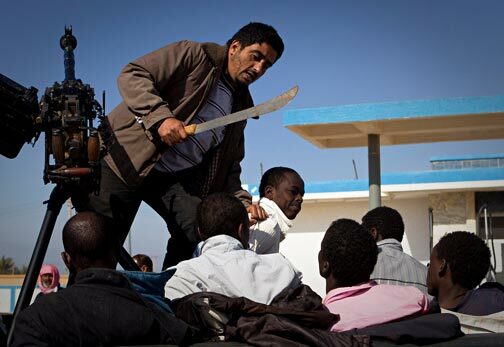 The massacre of Black Africans by the “Libyan Revolution”, The RCIT says, “However, the sectarian “anti-imperialists” sided with the reactionary Gaddafi regime and supported it against the popular revolution”. We can only assume he does not understand what ‘critical support’ means and that ‘a refusal to assess their own role in the post war degeneration’ designated the ICFI as a centrist current. The issue of critical support arises because we are obliged to support a left current against a right current because of the content of their criticisms and because their followers really believed they were conducting a fight for Trotskyism. Just as you would give critical support to a left trade union bureaucrat against a right trade union bureaucrat in an election; ‘critical’ really is the operative word. You cannot correct errors if you do not critically reassess them. IDIOT No 9 On the Continuity of Trotskyism, which was approved at the founding conference and by the LCFI, sets out our position on these questions. ‘1. complete reliance on the organised power of the working class. 3. Finish without delay the job of nationalising, democratising, and reorganising industry along socialist lines. The RCIT/Fifth International said Russia was a “Moribund Workers State” under Yeltsin when it was the most obviously pro-Western and privatising all state assets to the corrupt oligarchs (as also in Ukraine), to the delight of Western imperialism. Then, when Putin came to power in 2000 and began to adopt measure in defence of Russian capitalism against the USA suddenly they decided that it was a capitalist and what’s more an imperialist nation. So by a strange coincidence we are asked to believe now that it was political confusion that led them to adopt the ridiculous ‘Moribund Workers State’ theory and so defend the set-up in the former USSR that had pleased Western Imperialism so much. And then when Western imperialism was so disgusted with Putin because he would not do as US imperialism told him suddenly political clarity was achieved and Russia was a nasty imperialist power, equally as bad of the USA, or worse maybe with all its homophobia etc. And all this had nothing to do with abject capitulation to the ‘public opinion’ of the petty bourgeois milieu in which they operated. And perish the thought that the ridiculous “Moribund Workers State” theory was a consequence of them declaring that they stood “arm-in-arm with Boris Yeltsin” outside the White House during the Yanayev coup in August 1991. Imperialism’s favourite in August 1991 and also that of the RCIT and Workers Power to0 who stood “arm-in-arm with Boris Yeltsin” they proudly proclained at the time. Laurence Humpheries must stand there politically too now. 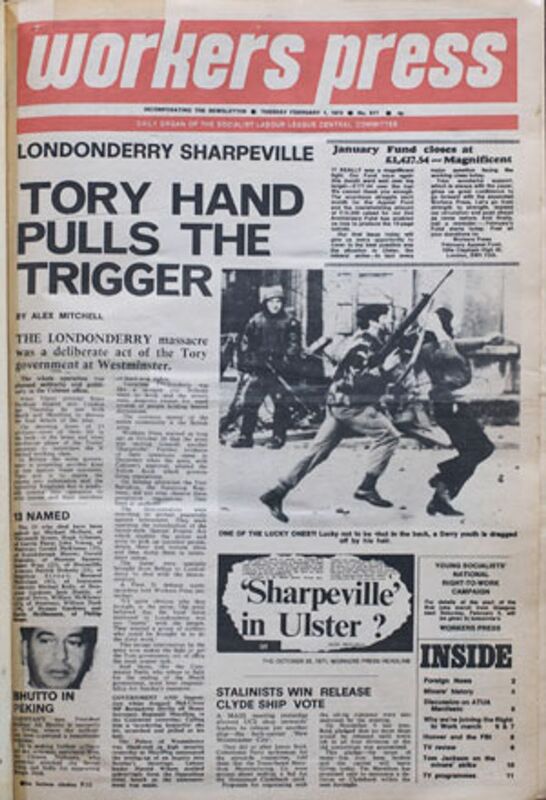 Looks good but it was still “Londonderry” and “Ulster” even in 1972. 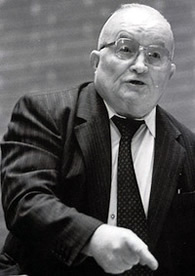 Healy called for the ending of the no-go areas in Derry. The British Army duly obliged. It is noteworthy that we have lost two comrades from the old WRP that we won mainly on rank and file work in the trade unions. Unfortunately we lost both over the same question; imperialism. 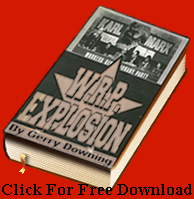 Ray Rising adopted to Bruce Wallace’s reactionary position on the Ukraine. Wallace has retained the unregenerated syndicalist and pro-imperialist positions of Ted Grant on all the foreign wars of UK imperialism from the Malvinas to Ireland to Libya, Syria and Ukraine. Similarly Laurence Humphries has indicated that he is now comfortable with the RCIT group that has such an appalling line on imperialism, the latest example of which is their pro-imperialism on the Ukraine. It was noteworthy that both comrades have never broken from the old Healyite national chauvinism position on Ireland. Both were unenthusiastic, to say the least, about the work of the Irish Republican Poisoners Support Group. Support for the anti-imperialist struggles of Irish republicans, no matter what our differences may be with them, is obligatory for all English socialists. And not just support, but active participation in solidarity work, especially for the POWs today. « Defend Lufur Rahman and Tower Hamlets: Down with this racist, Islamophobic judgement!